I have to admit, my expectations were on the very low end when I made these lemon sticky buns. 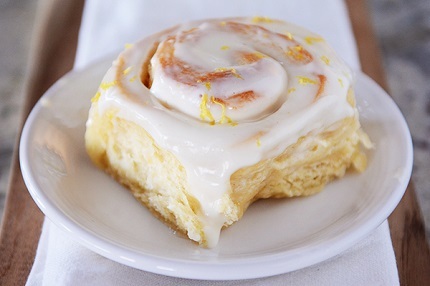 I desperately wanted a fun, new take on the almighty cinnamon roll for an upcoming breakfast-brunchy-thing I have next week but was skeptical lemon could really make a sweet roll as enticing as an ooey gooey cinnamon roll (or even be as delicious as my much-loved orange sweet rolls). As if it’s not obvious enough by the fact that I’m posting (hopefully you know by now I really only post the best of the best from the millions of recipes I make), let me be very clear: these light and refreshing lemon sticky buns are outrageously delicious. If asked how they manage to exceed expectations, I would say it’s the lemon zested buttermilk dough (a riff from this yummy buttermilk cinnamon roll recipe) that makes them wonderful. But then I’d feel like I ought to add a major point in favor of the buttery, sugary, fresh lemon filling because it wows me in unspeakable lemon-sugar-forever ways. All of which would be followed by instant regret for not mentioning the ethereal and luxurious lemon-spiked thick cream cheese glaze that finds its way into every little twist and turn of the fabulous little rolls. 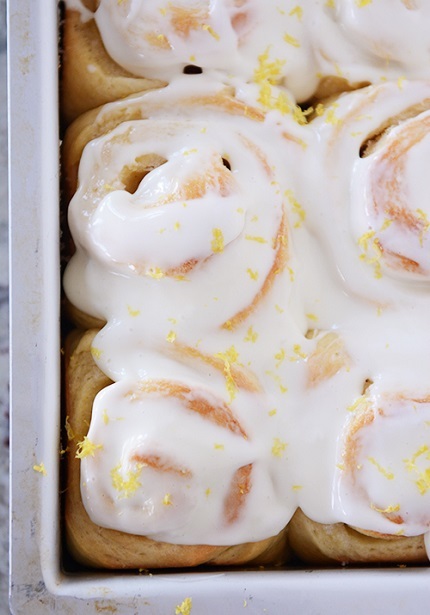 Basically all this is to say: lemon sticky buns rock. And: you should make them. 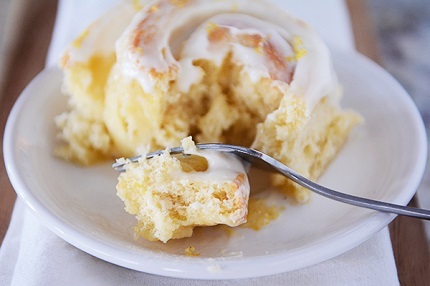 My only regret is wishing I had shaped them like the clever twist-method in these orange sweet rolls. It’s what makes those orange rolls extra-special and I think it would take this lemon version over the top. But as my insightful husband remarked whilst eating his third lemon sticky bun: I can’t honestly see how the shape has anything to do with the taste; don’t change a thing. So there you have it. Discerning palates say it doesn’t really matter but I’ll let you be the judge if you decide to venture out. You'll need three lemons for this recipe — you'll use the zest of all three and the juice from about two of them, depending on how big they are. For the dough, whisk the warmed buttermilk and butter together in a large liquid measuring cup. Combine 3 1/2 cups of flour, lemon zest, sugar, yeast and salt together in a standing mixer fitted with dough hook (or you can use a large bowl and mix with a wooden spoon). With the mixer on low speed, add the buttermilk mixture and eggs and mix until the dough comes together, about 2 minutes. Increase the mixer to medium speed; if the dough is still very sticky and hasn't cleared the sides of the bowl yet, add a little flour at a time until the dough has pulled away from the sides of the bowl but is still slightly sticky. Knead the dough until it is smooth and elastic, about 5-6 minutes (knead for 10 or so minutes by hand). See this tutorial for a visual. Don't over-flour the dough or the rolls may be dry — you're going for a soft, slightly tacky dough that gives when pressed with your fingers but doesn't leave a lot of doughy residue on your hands. Place the dough in a large, lightly greased bowl and cover the top tightly with greased plastic wrap. Let the dough rise in a warm place until doubled, around 1-2 hours, depending on the warmth of your kitchen. Meanwhile, lightly grease a 9X13-inch baking dish and set aside. For the lemon filling, combine the sugar and lemon zest and rub the mixture between your fingers until well combined and fragrant (the smell will kill you with deliciousness). Add the nutmeg and lemon juice and stir until combined. When the dough has risen, turn it out onto a lightly greased countertop and press it into about a 16- by 12-inch rectangle (doesn't have to be perfect). Spread the softened butter across the dough. Sprinkle the juicy lemon filling mixture over the top and spread as evenly as you can. Again, it doesn't have to be perfect. Starting with one long end, tightly roll up the dough cinnamon-roll style and pinch the seam to seal. Cut the dough into 12 equal pieces. Place the buns in the prepared pan — three across and four down. Cover with greased plastic wrap and let rise until very puffy so the sides of the buns are touching each other. Preheat the oven to 350 degrees F. Uncover the buns and bake for about 20-25 minutes until very lightly golden (don't over bake or they may be dry). Let cool slightly before frosting. I like to frost them when they are just a bit warm. For the frosting, whip the cream cheese and lemon juice together with an electric mixer (I often use my Blendtec blender to whip frosting like this) until smooth and creamy. Add the powdered sugar and mix until well-combined. Spread the glaze (or frosting or whatever you want to call it) evenly over the lemon buns and sprinkle with the fresh lemon zest.